From High In The Sky: I Did This, I Did That.. I Did This, I Did That.. So it gets to Thursday and I think to myself, I still have no idea what kind of a week this is going to turn out to be. Creatively it's been a little bit of this, a little bit of that, and not very much of anything at all. I pick something up and I put it down again. Two rows of rib here, a snip of some double sided sticky tape there..
although I have a couple of things on the go. Yesterday I picked up my littlest scissors and cut into some pretty Wilna Furstenberg files, just for the sheer pleasure of trimming paper. I don't have a silhouette, so "print and cut" for me really does mean print and cut. But Wilna makes it easy, so now I have a little stock of embellishments set aside for some new pages. I trimmed round another bunch of flowers recently, too, to turn a Gossamer Blue Life Pages card into a motif to put on my layout for this month's Inspiration Hop. It's going to go live on Instagram Friday 15th at midnight GMT, that's 4pm PST or 7pm EST. More printing and cutting. Aren't they clever? And, yes, I've been reading about knitting, too. Here's what I was thinking: I can knit a sock by going round and round on a circular needle until I have a tube. And a tube is basically a sweater, without sleeves. But sleeves are also tubes, and all of that can also be achieved by - yep - knitting round and round on circular needles. So I may be about to go large. But of course you know me well enough by now to recognise that I never start anything without looking at the book first. 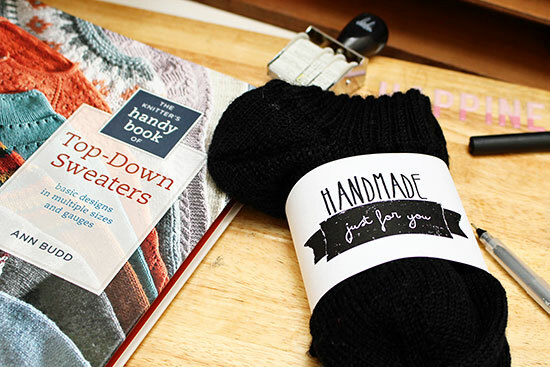 Top Down Sweaters is written by the same knitter, Ann Budd, who did the very first, basic sock book I ever read Getting Started Knitting Socks. It's a sign. Has to be. I'll let you know what happens next. In the meantime, how about 21 Original Definitions Of Creativity, just in case you need some help getting started on a new project too. Happy snipping ... I hope you do better with scissors than I do. J has had to Araldyte/strap up at least 2 pairs of mine. It's an affliction. oh goodness I will be so proud of you if you make something bigger! Looks like you have been having a nice week though with some pretty bits cut out and a plan to hang out with some like minded folks at a knitting crafternoon...fun times! Great labels! My mum in law knitted the girls some socks which I chucked in the machine at 40 C not realising they were there. They have shrunk. Been wondering what was your April sock design? Have I missed it? A jumper on circular needles? However many stitches to a row would that be? Oh my goodness, I've only just learned to juggle 64! We were talking today at work about how important it is to keep learning new things as you get a little older and how it helps keep the brain growing. The article you linked to about therapeutic knitting was very interesting, and I have now found a new blog to follow! What a great post Sian. I always enjoy reading about what you have been up to. I'm interested in learning more about the knitting meet up and your first impressions. 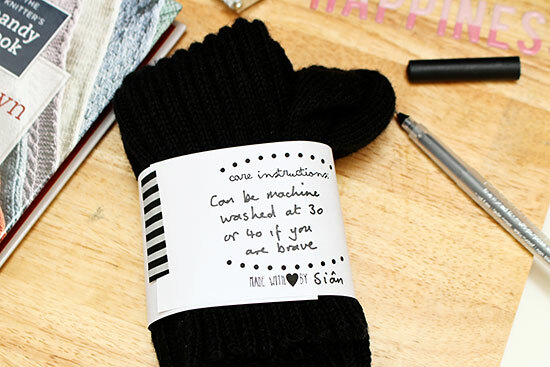 Those sock labels are perfect for delivery of a gift pair! How exciting that you're contemplating going larger with the knitting - looking forward to seeing that adventure unfold! I love those sock labels and I will definitely be looking at that blog. I find fussy cutting really therapeutic so I don't think I'd ever get a machine that does it for me. I do have a silhouette but confess that I often find it quicker to print and trim by hand then work out how to make the machine do what I want it to do. Practice and familiarity required - both of which need time which hasn't happened yet. 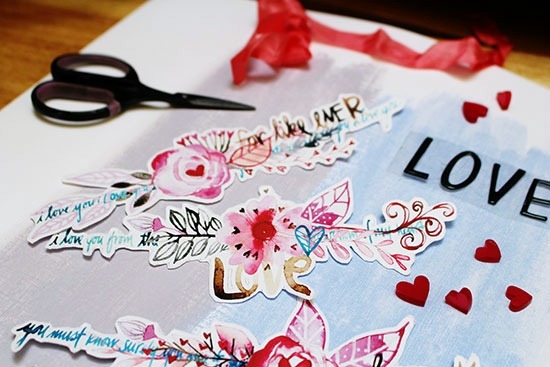 Gorgeous labels, what a neat idea! Like Missus Wookie, I often find it faster and easier to cut it myself than to figure out the Silhouette. Becoming more familiar with that machine is on my list for the spring and summer----along with a long list of other burning desires! 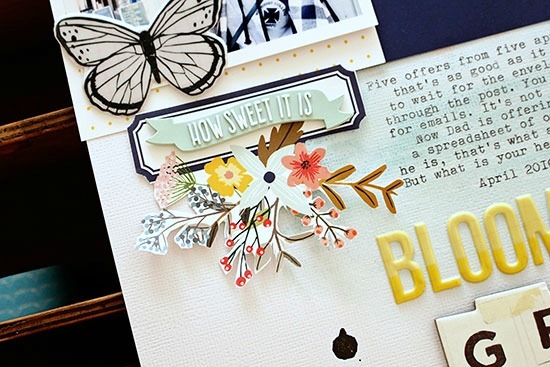 I love that cluster on the Gossamer Blue layout. 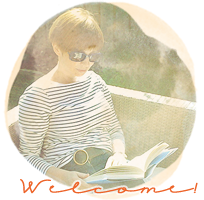 I'm catching up with blogs now that I'm home, and doing them in the order they were written so perhaps I'll see the finished layout in a bit.